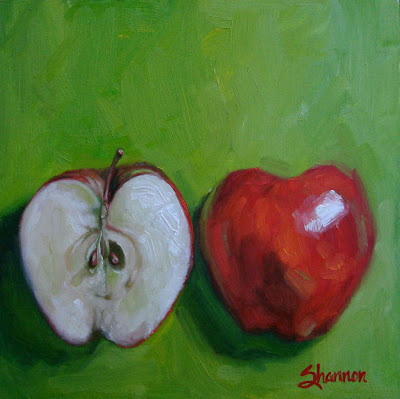 Today's Mini-Monday painting is an apple cut in half. I will name it later. I think I am having a need for brighter colors lately. Maybe it's the winter weather. I don't know but I like them. I don't know that I'd like these colors larger than this format though. I liked the idea of seeds for beginnings because of the obvious. But, apples also have many prior iconic meanings that have tie ins to beginnings. Like Adam and Eve (and the apple) in the beginning, Apple of someone's eye - their favorite, Newton and the falling apple linked to gravity, seeds and Johnny Appleseed who supplied seeds to pioneers, and then there is my favorite Apple (MAC) in the beginning of the personal computer industry. Well, maybe you have some other connections. Let me know and happy Monday. Update: This painting is inspired by my Mom who has been there since the beginning for me. An apple a day...maybe that has no relation to "beginnings". I'm diggin' the colors too! The colors and the apple, nice taste, or tease, of spring. There's nothing like grandma's apple pie...oh wait that doesn't have anything to do with beginnings but that's what the apple was making me think of. Ummm.